Drake: The New Face of Hip Hop, Really? The re-defined definition of Hip Hop DON'T dare say it's DEAD. 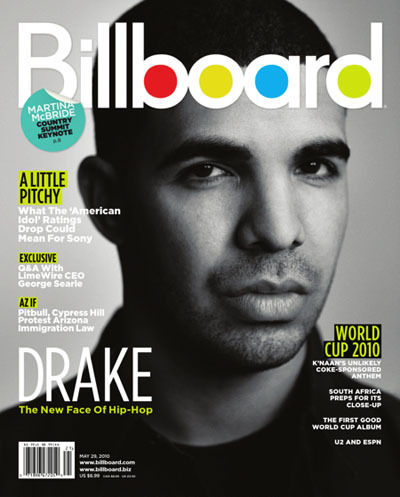 The rapper makes the cover of Billboard Magazine as the "New Face of Hip Hop." All we can say is REALLY? The magazine takes a look at Aubrey Drake Graham, born in Toronto, Ontario. Drake got his showbiz start playing Jimmy Brooks, the wheelchair-bound former basketball player on the Canadian teen drama "Degrassi: The Next Generation." Writer Mariel Concepcion pens, "As hip-hop continues to drift further away from rap's basic elements and seeks to re-energize and expand its fan base with a new, hybrid sound that blends rap, R&B, dance, even alt-rock-witness the success of B.o.B, Kid Cudi and progenitors Kanye West and OutKast-this half-singing, half-rapping, half-Jewish, half-black former actor and current heartthrob is helping change the face of the genre firsthand." If this is the new face of Hip Hop, all we can say is REALLY? How far can it stray away from its basic elements before the genre can no longer be referred to as Hip-Hop? Read more of the web edition article from Billboard.